I have been working on some more Aspect Warriors. Here are my Howling Banshees and Fire Dragons. As with my other Aspect Warriors I painted them using their traditional Aspect colours in order to make them easily identifiable on the battlefield. I have also tried to work red into each of the colour schemes to tie them in with the rest of the force. I painted the Banshees Dheneb Stone washed with Ogryn Flesh. This gave then a reddish brown tint. They were then highlighted using Dheneb Stone followed by Dheneb Stone and Skull White. I painted the Exarch red to match the 40k scale version painted by the ‘Eavy Metal team. I used Mephiston Red shaded with Baal Red. This was highlighted with Mephiston Red followed by Blood Red. The Fire Dragons were painted the same way as the Banshee Exarch but with an extra highlight of Blazing Orange. The yellow was painted using my technique for painting yellow. However, I omitted the stage where I shaded them Dark Flesh because of their small size. 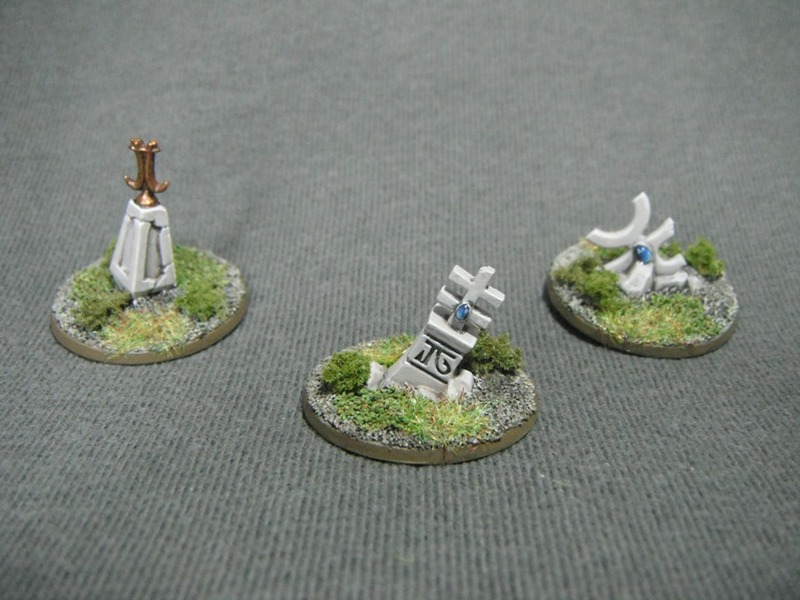 I have also painted some temporary objectives. I say temporary because, after having used them in a few games, I have realised that they are too small. I have an idea for something special for my objectives but I’ll keep that under wraps for now. 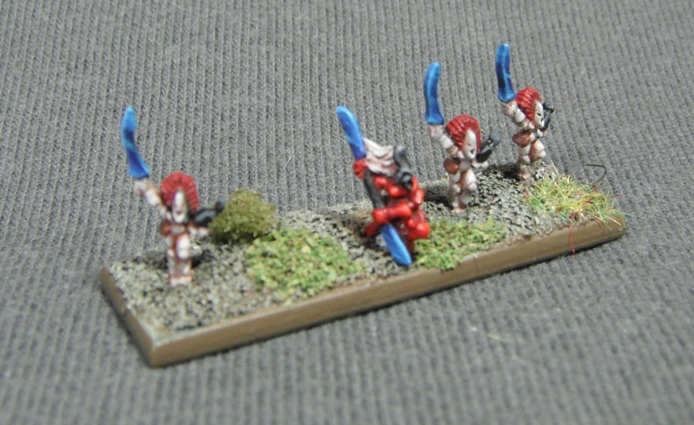 More Eldar reinforcements burst from the webway (or my painting table anyway). Here is my formation of Aspect Warriors along with my Autarch. When it came to painting, using the Aspect colours was an obvious choice. For models of this scale it made sense to use the traditional colours in order distinguish them on the tabletop. It also afforded me the opportunity to take a break from painting red. 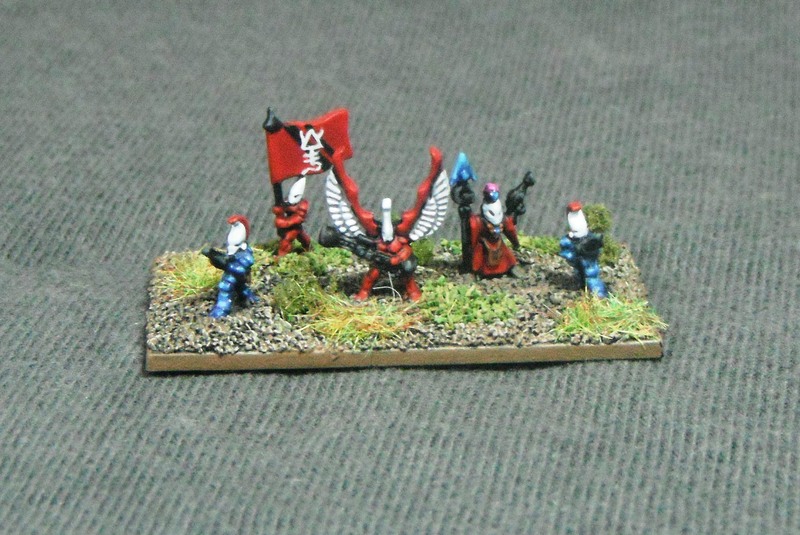 Here is my supreme commander, an Eldar Autarch. I wanted to do something a bit special with this stand and so I added an entourage to accompany him into battle: his personal standard bearer and a Farseer adviser. I chose to use the old Exarch model for the Autarch as it nicely matched the 40k scale Autarch model with the wings. In fact, I wonder if this old Epic model was the inspiration behind the newer sculpt. I decided to add my Autarch to a unit of Dire Avengers (for those of you unfamiliar with Epic, an Autarch is purchased as a replacement for an Exarch and must be added to an Aspect Warrior stand). This was so that he would benefit from a ranged attack and would be less likely to be killed in combat. Initially I was worried about having the blue Dire Avengers on the same stand as models painted in the red of Saim-Hann. However, the red on their crests combined with the blue on the Farseer’s gemstones and spear help to integrate them. The symbol on the banner is the Autarch rune copied from Codex: Eldar. The other side of the banner bears the symbol of Saim-Hann. The Dire Avengers were painted Regal Blue and highlighted using Enchanted Blue followed by Ice Blue. 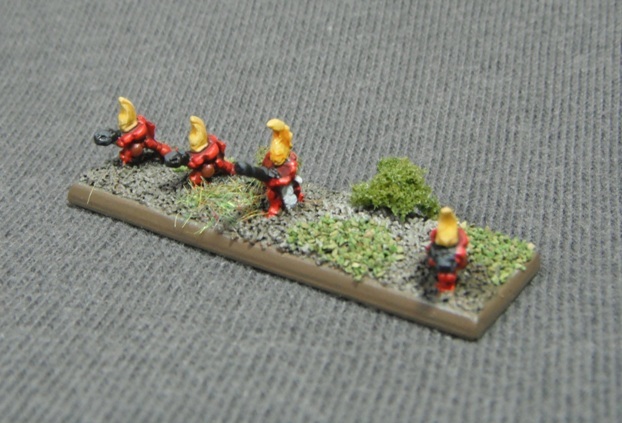 The Striking Scorpions were painted Dark Angels Green and Highlighted using Camo Green. Unfortunately the Striking Scorpions don’t stand out all that well against the green of their bases when viewed from a distance.